There are three seasons in Myanmar: Summer (damn hot), Rainy (damn hot and wet), Winter (pretty damn hot). We visited in Summer. Of course. That’s among the things I learned on our second day in country. Again as yesterday, my education was aided by a guide — this time not a politically charged up young man — rather a charming, giggling between every other sentence, young woman. The bottled “drinks” displayed in vertical wooden racks by vendors all along the road to Yangon are in fact filled not with lemon soda or iced tea as the vessles and labels would imply, but rather with petrol… to top up the tanks of the sea of motorbikes that ply the route. 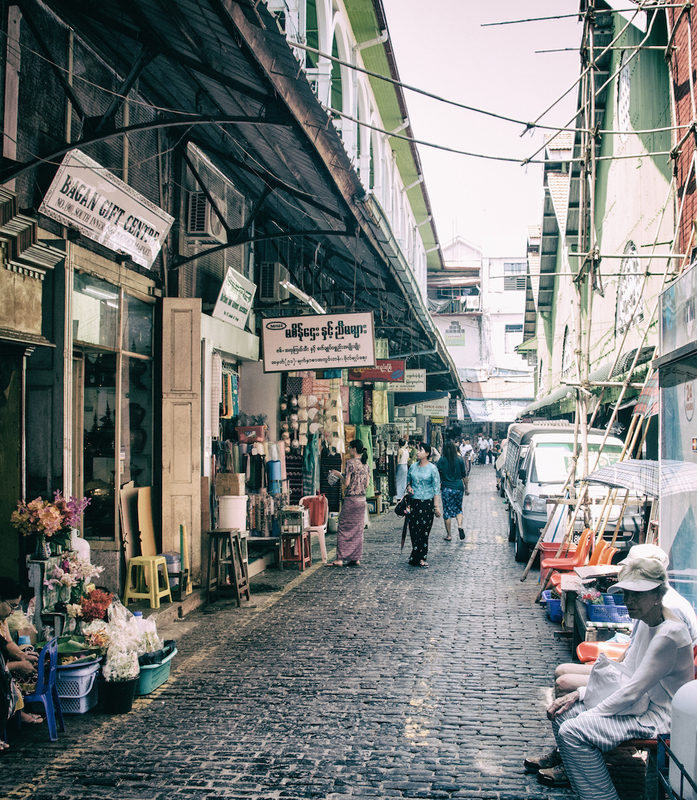 The rise of a monied class of business people working in Yangon, along with rapidly escalating prices downtown, has led to a surge in upscale housing development in the city’s surrounding regions. Think: ’80s style condo complexes sitting hard alongside miles of shacks as context. As I commented yesterday, it’s a land of mixing realities. Aggressive drivers are the same the world over. The captain of our coach showed great enthusiasm for the use of his horn, and would turn to glare over his shoulder at length, with menace and incredulity, at all who failed to live up to his standards of suitable road etiquette. 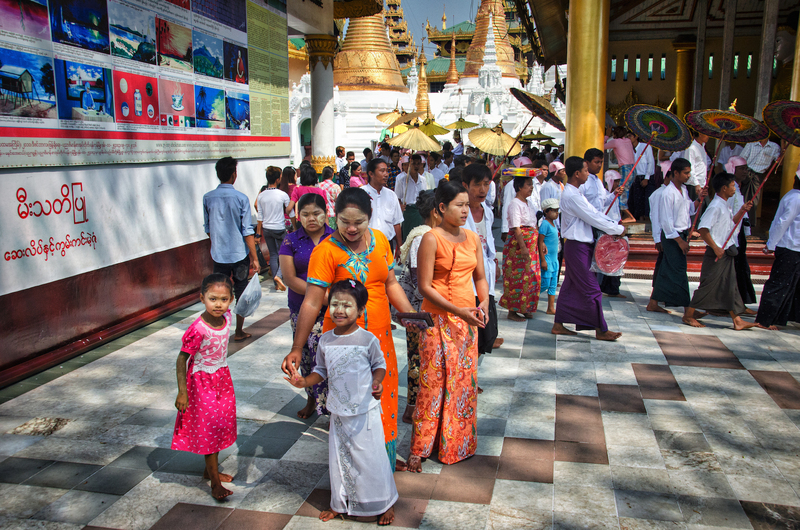 We arrived back at Shwedagon Pagoda just in time to witness a coming of age initiation ceremony, with featured participants aged eight to eighteen, (the youngest crying, the eldest glowering) proudly accompanied by their relatives. I learned that it’s common to set the qualifying age so as to ensure that grandparents are able to witness the ceremony from this world, rather than the next. It’s amusing to be the subject of reverse tourism. Ellie and I, seeking shade, found ourselves sitting alongside a group of local teenagers… who, with hesitancy that gave way to courage, proceeded to document us at great length with their mobile phone cameras as, presumably, examples of an exotic species from a far off land. Next stop was at a downtown open air market, timed most cleverly to coincide with the peak heat of the day. Our guide suggested caution regarding the provenance and quality of goods on offer, and expanded, “The ‘Government Registered’ designation you’ll see on many shops means that they are selling what they claim, but carries no assurances on authenticity or quality.” Crystal clear. Ellie showed her creative pluck by entering one of the very few air conditioned shops, at the peripheray of the market, and negotiating — very slowly — without any intent of positive outcome — for the non-purchase of a piece of jade (a $2300 hand cooler of no distinguishing merit)… giving just enough time for the outflow of sweat from my brow to slow. Our transition to the day’s next stop, lunch at the Shangri-La Hotel, was delayed by fifteen minutes (felt longer in the tepid coach atmosphere), by a couple who got caught up in an extended negotation toward the purchase of some local fabric. Their arrival back at the coach was met with steely glares. A photo stop at the larger of two downtown lakes in Yangon… cleaner for the workings of a pair of machines donated by the Japanese. 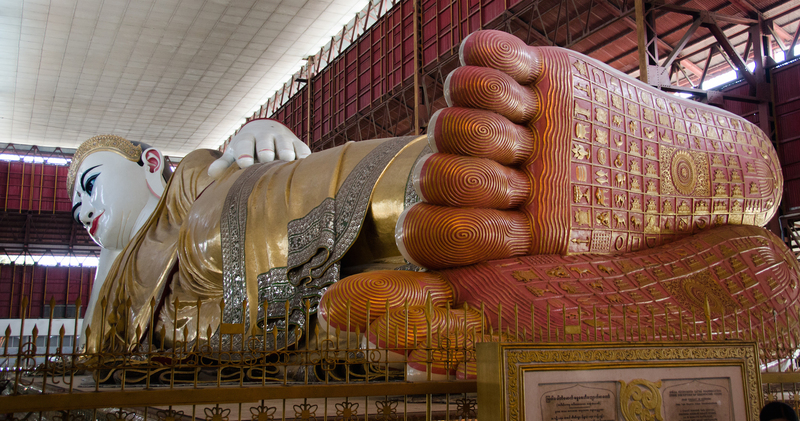 … and a pavilion built to house “the fifth largest reclining Buddha” (one of three canonical poses). …How the truth of all of this was driven home for our guide by the fact that her astrologer fortold the need for her to deliver her baby by C-section. We left Myanmar much richer for the brief time spent there. The experiences we had over this past weekend, while packaged and choreographed (as these sort of things always are), will live on in our memories for a very long time as not just fascinating, but as deeply revealing of human realities, and fundamentally real in all of their complexity. Posted in People, Religion, Travel.